We’re entering field and meeting season, and, for parents with nurslings, this presents some extra challenges. I am regularly asked for advice on practical aspects of traveling while pumping, and figured I might as well write up a post on it. I’ve been fortunate in having colleagues that I could ask about this, but I realize that not everyone is that lucky. Hopefully this will help. But, first, the very obvious disclaimer that this is just what I do – I am certainly not a breastmilk storage expert, and this is obviously not medical advice. I was also going to include a disclaimer that many (most?) of our readers might want to tune out (thinking only nursing moms would be interested in this), but tweets from Terry McGlynn and Joshua King have made me realize that’s not the case. Many thanks to them for that feedback! I am also adding a bonus section at the end for people who might be hosting a visitor (e.g., seminar speaker) who is pumping. 1. Get a hands free pumping bra. It really is worth it, in my opinion. It will let you work on your computer (or, you know, read your favorite ecology blog) while pumping. 2. When pumping at work, I put all the pump parts in a Tupperware in the fridge in between pumping sessions. This saves a LOT of washing of pump parts. Washing pump parts is incredibly annoying, so this is a very good thing. 2. Call ahead to the hotel to ask them to put a mini fridge in the room. Sometimes there’s a charge for this. And sometimes I need to ask again when I get there, but usually they’re on top of it. 3. Fly there with my regular pump, as well as my cooler with a giant ice pack in it. I tell the TSA people I have an ice pack in a cooler so I can bring breastmilk back with me. They’ve never cared. Sometimes, I wonder if the screener person even noticed. 4. Hope I don’t have to pump in the airport. If I do have to, I go to a handicapped bathroom. I’ve tried asking for other places, and there are supposed to be some airports with rooms for pumping, but I’ve never been lucky enough to find one. Ideally, have backup battery power for your pump, because the outlets in the handicapped bathroom don’t always work. (And yes, I know you’re never ever ever supposed to pump in a bathroom, but I do what I have to do sometimes.) I originally brought along a hand pump as a back up, but I really hate the hand pump, and ended up hand expressing in a bathroom stall instead the one time I was desperate. Fun times. 5. Once there, give the hotel my big giant ice pack to put in their freezer. If I need it during the day (b/c I won’t be back at the hotel to pump), I get it back from them in the morning. Otherwise, they just store it for the whole time I’m there. 7. I store all the baggies of milk in the fridge in my room, then load them all up in the cooler with the ice pack for the way home. They then all get used up ASAP when I get home. I do NOT freeze the milk while I’m there, because then I would have to worry about it thawing on the way home. 8. When going through security on the way home, I tell them I have a cooler of breastmilk (and put the cooler separately on the belt). It’s never been an issue. There was once when they made me take the breastpump out of my bag to inspect that separately, but that’s only happened once and was at a very small airport. I think those are the big things. This was definitely something I was anxious about before I traveled the first time, but, fortunately, it’s never been an issue. The main annoying thing is that the pump + cooler take up a lot of space (and several days worth of breastmilk weighs a lot! ), and I like to travel light. On a related note: I was still pumping when I traveled here to Michigan to interview. I was a bit nervous about bringing up the need to pump during the day. Fortunately, I felt more comfortable because the chair of the search committee was a woman, and I knew she had a child. In the end, it wasn’t a big deal at all. Another faculty member was kind enough to clear out of her office so I could pump there, and it was actually nice to have a little down time in the middle of the day. 1. Access to a fridge during the day would be great, as would be a place to leave a cooler and the pump. 2. Access to a clean, quiet, LOCKED space where the mom can pump would also be great. This should NOT be a bathroom. As I said above, I’ve done it, but it’s definitely not ideal. Pumping in a bathroom is essentially preparing your child’s food in the bathroom — not something most of us would prefer to do. 3. Ask the speaker when she would like the pump breaks. 4. Put it on the schedule that you will be meeting with the speaker during the pump breaks. If people see “free time” or “break” or something like that on the schedule, they are likely to view it as not a big deal if they cut into that time. And now a question for our readers: Do you have other tips, either for the traveler or the host? I’m sure I’ve forgotten some things, and that there are tips I’m not aware of yet! I wanted to put that up here in the main post, knowing that many people don’t read the comments. Thanks for the info, Margaret! This entry was posted in Advice, Instructional by Meghan Duffy. Bookmark the permalink. 2. If you can swing it, you might also consider pumping and dumping when traveling. A little part of you might die every time you dump a bottle of milk down the sink, but if you are lucky enough to have enough of a milk stash at home, it is immensely easier to pump and dump on the road than it is to deal with coolers, ice packs, dishwashing in hotel rooms, etc. Good ideas! I’ve considered pumping and dumping, but I just can’t handle the thought of dumping milk! I agree that a little part of me would die every time. 🙂 I think I tend to be overly anxious about having a big enough freezer stash. I also did an interview while breastfeeding and my experiences were similar. The department I interviewed with was very accommodating, scheduling pumping breaks and giving me a private and locked room where I could pump and store my gear. I opted to do the pump and dump route that Kim mentioned because I had enough time to stockpile before I went. You do die a little inside every time you dump milk down the sink, though. I found that many, though not most, airports do have a family bathroom or just ‘family room’ (i.e. changing station and sink, but no toilet). Having a pump that can run on batteries was pretty critical for me because I generally had little time on lay overs and invariably the bathroom was being used before me by someone who apparently was less pressed for time, making timing even more critical. Hand pumps are great for emergencies because you can tote them around in your purse, but I never could make them work as quickly as an electronic pump. Yeah, I failed to consider the potential for not being able to access an outlet on my first trip. That was definitely a mistake! 1) I have had a BAD experience with TSA when flying with a breast pump and paraphernalia. It is very important that any ice packs you have be COMPLETELY FROZEN (even if you’re just on your way to a conference and have no milk that you’re currently carrying). That way the ice packs are a solid and not a liquid. If they are a solid, they will be allowed through security. If they are not frozen, then they can be classified as a liquid and prohibited from going through security (if you have an obnoxious/naive TSA agent like I did). 2. Also, at TSA they may “wipe” your milk bags/bottles with a little tissue. They run the tissue through a machine that checks for explosives or something. I don’t like them messing with my milk containers, but just know that this is normal standard procedure. 5. For conferences, request ahead your need to pump. Contact the person who is listed for “special accommodations” and ask that they provide a nursing room for you. Tell them *exactly* what you need; most people seem to be clueless about what a nursing room is. And follow up right before the conference to make sure it’s happening! If the conference you’re attending has childcare service, things may be easier for you. The childcare room will likely have a fridge. Two years ago I requested a nursing room at ESA. They said they would provide one, but when I arrived, it was clear no one was sure where there was such a room; I don’t think they understood what I needed. But the organizers were very helpful anyway, and let me use the freezer in the staff room to keep my ice pack frozen, and I used the fridge in the childcare room for my pumped milk. I also had to pump in the baby childcare room, but it was pleasant; a couple babies and their caretakers, a dimmed and quiet room; I faced the wall and did my thing. 6. If you’re used to pumping because you do so during the workday usually, things aren’t much different at a conference; try to keep your same schedule and replace your normal nursing times with pumpings. But if you’re completely unfamiliar with pumping, don’t try to learn during a conference! Practice ahead of time (because it does take some practice), so you can do it relatively efficiently when you’re traveling. 7. Meg’s tip on putting pump parts in the fridge between pumps is a really good one. I tend to just rinse, but not wash mine, which is faster than a full wash and means they’re not *cold* when I go to use them! But make sure you wash your parts once a day, whatever method you use. 8. If you can’t get a *locked* room at a conference/meeting/interview, but you can get an empty one, I’ve found just putting a sign on the door works wonders. Excellent ideas! Thank you so much. And thanks especially for the tips on the MSN airport. I’ll update the main body of the post so that people who don’t read the comments will be aware of those rooms! FWIW – don’t remember if this was from my days of yore travelling with breast milk or something else – but I had a TSA agent who sounded like they knew what they were talking about say that it was legal to carry on bags of frozen peas or corn to keep something cold as they were solid and foods. But using ice or icepacks was illegal because they were liquids or gels (regardless of whether they were frozen or not). What matters here isn’t what the rules “really” are, it’s how they’re applied by individual TSA agents. My wife and I have flown with frozen icepacks for breast milk many times and never had a problem–but that could just mean we got lucky with our TSA screeners. I agree with Jeremy. For this reason, it probably makes sense to have a printout of the rules from the TSA website in hand while traveling. I’ve never done that, but, given the variation in experiences, it would probably be worth doing. The one time I ran into an issue with a TSA agent was a time when I requested not to go through the body scanner while pregnant. The agent I was talking to wasn’t happy about that, but then another agent came over and told him it was fine for me to just go through the metal detector. So, if running into an issue related to breastmilk and/or ice packs, it might make sense to ask for another agent to see if that helps. I believe the current rule (things keep changing) is that frozen ice packs are allowed for “medical purposes” — breast milk generally falls under the medical rules. Pro Tip: You are never required to go through a body scanner (or metal detector), pregnant or not. You can always ask for a hand search and if you’re pleasant about it, they’ll generally treat you relatively decently (although they may try to talk you out of it, because they find it annoying to have to do). I’ve been asked by TSA to run my milk through their extra scanner each time I’ve gone through security – some airports have checked every single bottle, another only selected a random few. I don’t travel with the bags because I’ve had bad experience with them leaking at home, so I combine pumpings to fill the medela hard plastic containers to the max. I’ve used the “dressing” area of airport bathrooms or the diaper changing area with success for pumping – whereever there was a plug and if I’m lucky, a place to sit! I encourage everyone who is on an interview/seminar trip to be nonchalant but upfront about pumping breaks. In my first interview while pumping, they had not explained to the (male) professor I was meeting with why I had a break in the next slot. It was incredibly awkward for me at the time to explain it. Now, 5 years later, I try to just state it simply to try to let everyone know they can talk about it without embarrassing me. I acknowledge that others may be more modest that I, just my 2 cents! Are you saying that you wish you’d been more upfront at your first interview? I suspect that getting more comfortable discussing it just comes with time & experience. I still feel a little awkward when I have to explain why I need to leave a meeting, or why I need to run off between meetings; I simultaneously feel like it is a totally normal thing that I should feel comfortable discussing, and a little awkward actually discussing it. Sigh. Here’s a few Dad tips to help with the process. Discuss and plan milk management while Mom is away. Do you have enough? You both may want to develop a “stockpiling” system well ahead of time to assure supply if trips away last more than a few days. Develop a deep understanding of the pump as an apparatus. They are actually quite fascinating machines and, if properly cared for, can last for many years and many babies. Better machines have better, variable suction and variable pumping rates which is important to help keep supply stimulated and to make sure that every pumping session gets through to the “hind” milk. You can be a real help to Mom if you know all the parts, keep them clean, and make sure that she has all of the right parts, including extras, for trips (the little parts, like the suction flaps in the bottle tops, in particular). The absorbent breast pads, too, for Mom’s that use them (they often run out or get forgotten). Cleanliness of the parts can be a challenge as some parts are very small and may need extra attention when cleaning. Non of this is to say that Mom can’t do the this stuff too, but breast-feeding is a labor intensive endeavor, especially when pumping is part of the process. The labor for Mom can be reduced by a Dad that is cued in and helpful with keeping the pump running and ready for Mom at all times, and being actively involved in the maintenance of the milk supply – for example date all frozen milk (3-6 month freezer life) and make sure you are rotating out the older milk first. Feeding the baby is the easy part, Dad. So stop thinking that is the end of the “help” you can offer to a breast-feeding Mom. Yes! Loved it when my husband washed pump parts for me. Another benefit of the better pumps: good customer service. My Medela started dying after 8 or 9 months of (a lot of) pumping. I called their customer service and described the problem, hoping I might be able to replace a pump part instead of the whole thing. They had me do some over-the-phone diagnostics, and then sent me a new pump *overnight* for free without me ever specifically requesting one. Thank you for this post! It’s great for so many reasons, not the least of which is the fantastic practical advice. I had my daughter during grad school and was lucky enough not to have to do much travel (and no field work) while she was still breastfeeding, but what an encouragement this post would have been during that time! Thank you Meg and thank you Jeremy. Thank you so much for commenting! I felt a little awkward about writing it, but then realized that it could be useful to people who didn’t have another source of advice on the practical aspects. It’s great to hear that you would have found the post encouraging! I haven’t used a hands free bra, so I don’t know how they compare, but haven’t had any problems with this simple method. Oh wow, that’s great! I’ve heard people say they used an old sports bra instead of buying a hands free pumping bra, but that always seemed more awkward to me. It seems like it would be much harder to get the sports bra on and off. The ponytail holders, on the other hand, look really easy. Thanks for that link! And I’m glad to hear you enjoyed the post! As I said in response to Gina above, I debated a bit about whether to post this, so it’s nice to get positive feedback! Agreed, this is an easy and cheap way to avoid a hands-free bra! Josh covered the Dad issues pretty well. Here’s more perspective on pump-and-dump. Dads might not fully appreciate, physiologically, that nursing is a positive feedback loop. The more one makes milk, the more milk is produced. So the primary purpose of pumping while traveling is to maintain the milk supply. Of course it’s great to be able to keep the milk and bring it home, but that’s just a great side benefit of pumping – the main reason is that you need to make sure the kid gets its meal when mom gets back home. At least that’s how I see it. Like y’all have written, every ounce is hard won and precious. But the real value is that it ensures a future supply. It isn’t criminal to give your kid formula. We managed to never have to buy any formula at all, but I wouldn’t have been opposed to it if schlepping milk around and home from a week-long conference would be an issue. If it were me, it’d be hard to imagine pouring milk down the drain, and we didn’t do that, but you should feel totally fine with doing it, and using formula when the freezer stash gets low, if bringing milk home is too much fuss. Again, the point of pumping while traveling is the supply, not the milk itself. (I realize some kids are picky about once they get one kind of beverage that they don’t like another. I don’t have direct experience with that, though.) But hey, if you can bring it home, that’s wonderful. I know some people have done the express mail, too. Just take the foam box that the taq came in, and replace it with unfrozen milk on ice, and you’re good to go. Another thing to keep in mind as the Dad is to be as low-key as possible, because stress isn’t good in general, but stress about nursing isn’t good for milk production. With the equipment, the frequency, pumping can be worrisome. It’s your job to smooth that road a much as possible. A huge part of that is to emphasize that the volume of milk that comes home doesn’t matter. What matters is that the travel is successful, that she has a fun time, that she has the opportunity to get more sleep than usual, and that she has plenty of time to pump to keep the supply up for when she does get back with the kid. And, if she doesn’t mind the pump-and-dump, then this could be a good time to indulge in few cocktails, too. Thanks for the feedback! Your comment makes me realize I didn’t discuss length of the trip. Depending on the age of the baby, a one week trip may be rough for some moms, no matter what the size of one’s freezer stash. A pump isn’t as efficient as a baby, and a lot of women find that they get increasingly uncomfortable until they get back home to their baby. If mom was going to be gone for a longer trip, I’d recommend being really thorough about trying to massage while pumping to keep as much milk flowing as possible. It can always work to hand express in addition to pumping, since that can get different areas to flow. As for formula: yes, that is clearly an option! If it seemed like the breastmilk might not last through the whole trip, I would guess that mixing formula and breastmilk together might work better, in case, as you mentioned, the baby is picky about his/her food. Some people also use donor breastmilk, but there is obviously a lot of variation in what people are comfortable with. The other main reason for pumping to maintain mom’s “comfort” — a nice euphemistic way of saying moms pump so they’re not in excruciating pain. I like trying to come up with body analogies, so imagine having to pee really bad, but not being allowed to. Now imagine continuing like that until it physically hurts. That’s what it’s like if nursing moms don’t pump, more or less. Also, I *always* think I’m going to get more sleep when I’m away at a conference, workshop, doing field work, etc. It never happens. So husband-dads, don’t imagine that your wife-moms will come back any better rested than when they left! And not just comfort — not draining the breasts can lead to mastitis, which is awful. I have never felt as sick as I did when I had that. Right! I should have mentioned the health importance, too; I have been lucky to not ever suffer mastitis. I just wanted to add that it is okay to take your baby along, too. Neither of mine were good enough with the bottle to be left behind so I took them to meetings, working groups, workshops and invited seminars, with my husband along, too (through their first year). This worked well as my husband is also an academic and also got a semester of parental leave (not at the same time as me). With the second, that meant that all four of us went along to the few invited seminars and working groups I felt I had to (wanted to) attend during that first baby year. We were always well accommodated. For example, we were given a whole room to hang out in (vacant conference room) during one seminar visit, where our child could play, and I could come and go to feed the baby. Working groups and workshops (and meetings) were somewhat crazy to do this way but doable (and better than not attending at all, I think). Awesome option if you can afford to bring a caretaker with you! I just wish there was funding for this somewhere. I am going to try this for the first time in a few weeks when I go to Evolution. My baby is going to come along with me, and my mother and sister will meet us there. UMich has recognized this as a barrier to young academics attending meetings, and they have a new program that will cover the cost of my son’s travel to the meeting. (It does not cover costs related to my mother and sister going.) I got a hotel room close to the conference, and am planning on running back to the hotel room to nurse. It’s great to hear that people were accommodating! I’ve been bringing my baby to meetings on campus with me, and everyone has been great about it. Actually, they seem disappointed when I show up without the baby. It helps that he is still young enough that he just sleeps in the carrier, for the most part. The last couple of years I’ve definitely been seeing more moms with infants sleeping in carriers attending the ESA meeting. You didn’t ever used to see that even just a few years ago. I’ve also seen several nursing moms attend NCEAS-style workshops and duck out every couple of hours to nurse. Caretaker and baby can also joined in meals. I think this has happened at at least 3 different meetings I’ve been at. Not only was everybody else supportive, but many attendees were thrilled to see a kid in these all adult settings. It does require the cost of the caretaker flying, but it is definitely an option. In the UK a number of universities have special funding available for staff travelling to conferences/workshops/fieldwork who have dependents that they either need to take with them, such as a breast fed infant and carer (other parent usually), or pay for someone else to help out with their care whilst absent (elderly parents/older children with specific needs etc). Its not a huge amount of money but usually enough for a plane ticket for the extra person, and some accommodation. I took my 4 month old to a conference in France and her Dad came too – it worked out pretty well, I just fed in the breaks and a small baby is great for making networking easy! I just wanted to add that this is a great post, Meg, and others. Thank you!!! And that I appreciated your post on “how often do you travel?”, which relates to this one, and which I found reassuring (I’m not slacking off by dialing my travel back — just normal). Thank you! I’m glad to hear you liked it! I have a couple more tips. 1. Once you get through security, ask for a cup or two of ice from a restaurant/fast food place. On the plane, get a couple of the airsick bags. THESE ARE INTENDED TO BE WATERPROOF. Hence, you dump the new ice in there and they can go in your cooler with the pumped milk. Got this tip from a colleague who got it from a flight attendant. 2. The hotel will often waive the charge for an in-room fridge if you tell them it is for breastmilk. They do that for medicine, too. If they don’t offer, tell the manager that it is SOP at many hotels. 3. If you are interviewing or something where your itinerary is packed and made up by other people, the admin assistant who puts these together is most likely a women and most likely familiar with the issue. I sometimes have felt awkward with saying that I have an “X-month-old”, when X > 6, since I know some people can be so judgmental about how long people nurse for. But, for the most part, people have been very supportive. Thanks for this post. It is great. I am (sometimes thankfully, sometimes sadly) past my breastfeeding days, but I still enjoy reading posts like this. I only *had* to travel one time while my baby was breastfeeding and just pumped-and-dumped. The other times I took my baby with me (with the second baby, dad stayed home with the toddler). The most difficult trip was when I returned for a second visit for a faculty job with my 4-week old (I interviewed when I was 38 weeks pregnant – another story). My husband, toddler and newborn all came with, but I still needed to schedule breastfeeding breaks. That can be even trickier than scheduling pumping breaks, because you need the baby in addition to a quiet room! My experiences were very positive though, with all organizing parties totally accommodating. Wow, interviewing at 38 weeks is impressive! And it’s great to hear that people were accommodating. I think (hope?) places have gotten much better at handling this sort of thing. Wonderful post! I also agree with everyone: be upfront if you’re pumping during an interview, conference, etc. It’s not a big deal at all; mine was scheduled as “personal time” but I think everyone pretty much knew what was up. Bring back up membranes! One of my pump membranes ruptured a bit during an interview (UG!) and I didn’t realize it right it away and I NEEDED to pump. Luckily I realized the problem and was able to pump before my next meeting. Button-down shirts were also very helpful, and an extra thin blanket in case you do have to pump in a more public place. Does anybody have experience with similar situation above but more days on traveling for example a month or above? It is quite impossible to store a month of packed breast milk (isn’t it ? ).Have you ever sent your milk from your conference place to your home? Another thing I would worry about with a trip that long would be maintaining supply, and making sure I didn’t get plugged ducts/mastitis, since, as I said in another comment, your baby is better at removing milk than any pump is. I would think it would be important to have a high quality pump, and I’ve heard from people who exclusively pump (EP) that they also do a lot of massaging while pumping to get things flowing. It would probably be worth looking up tips on EPing. Good luck! I will ask on twitter to see if we can get additional ideas. If you’re breastfeeding but going to be away from the baby for a month or more, I really think you ought to get advice from a doctor. Obviously, there are a bunch of issues here. Just my two cents. Unfortunately, a lot of doctors do not know a lot about breastfeeding, though there are certainly some who do. Maybe a combination of asking a physician and a lactation consultant? Lactation consultants could help here. Your pediatrician should be able to help you find one. They are so, so helpful. I’ve consulted one at different times when I had big “milk” problems to solve. I have had success finding local caregivers using Care.com. Its scary to leave the little one with someone I don’t know, but being able to check in on them during breaks helps a lot. My university subscribes to childcare websites to give us free access, I assume other universities do too. Pumping and dumping is a total bummer. I have avoided this by donating to a milk bank or finding local moms who have a milk shortage through milk-sharing groups. These are great folks, and if you have questions about non-routine things, like being away from your baby for a whole month, they’d be a great resource. There are local chapters all over the place. How did it go at Evolution? Are you going to ESA? I am going to ESA with my 11 week old infant and my mom as caregiver. It hadn’t occurred to me to ask for a nursing room. We are staying at the Hilton and I was just planning to go back there or have my mom meet me in an area with some couches. It went really well at Evolution! Having the nursing rooms at the meeting venue was really helpful because then I didn’t have to miss as much of the meeting by going back to my room, and didn’t feel self-conscious due to needing to nurse in front of everyone. (Not that I think people would have cared, but I would have felt a bit awkward nursing in front of that many colleagues.) Based on this comment on another post, it sounds like one option in Minneapolis will be to nurse in the childcare room, if you’d prefer that. I am not going to ESA, unfortunately. I already had 6 work trips planned in a 5 month period (so much for my plans to cut back on travel! ), which is already too much with a toddler and a baby. So, I’ll be missing out this year, unfortunately. I’m very sorry to be missing it! 1. As much as I appreciate childcare/nursing options at conferences, I don’t think it solves the bigger problem of making working and motherhood more compatible. Bringing caregivers and children along is expensive and logistically difficult, as this post indicates. 3. I recently traveled without my baby and shipped my milk back. I fedexed two styrofoam boxes in advance to my destination, with ice packs. Re-froze the ice-packs and then shipped my frozen milk back each day (3 frozen milks, only one ice pack.) It was really easy, and the milk had only started to get a little slushy by the time it arrived, about 19 hours later. 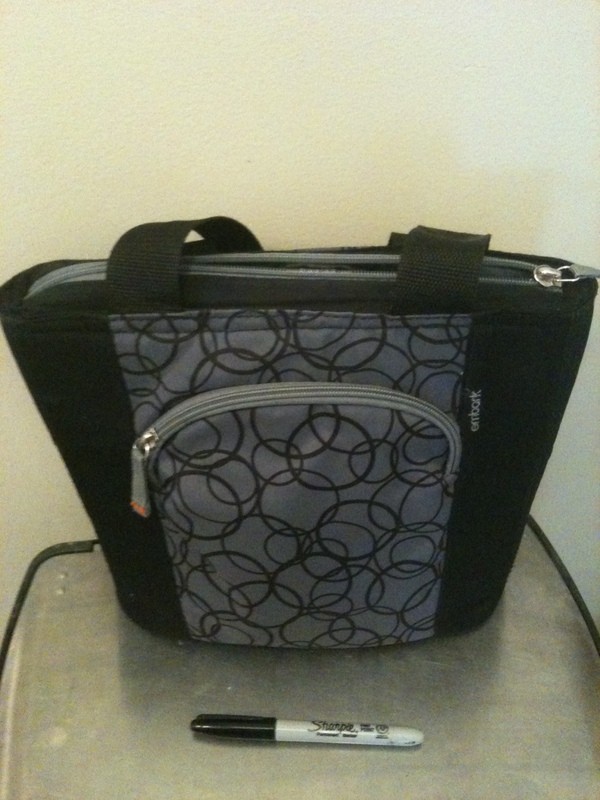 I am lookong for a good travel cooler snd was excited to check yours out but The link to picture is no longer active. Can you send me info on the cooler you like? My first business trip is in 2 weeks and I will be gone for 3.5 days. Eek! Thank you so much for this useful post! I will be traveling and pumping for the 1st time next month and it’s amazing how hard it is to find really useful advice. May I ask a quick question? If I will have 3 days of refrigerated milk, will it still be ok to just use a regular ice pack? I don’t need to get dry ice to make sure the temp doesn’t drop too low? The total travel time door to door will likely be 4-5 hours. I think you’ll be fine with an ice pack and 3 days of cool milk packed in a cooler. If it ends up taking longer, you can get ice from a food vendor. Also, milk isn’t *that* fragile, and assuming you’re not about to travel somewhere super hot, I think you’ll be just fine. Will it be in bags or bottles? If bags, I recommend bringing some larger ziplocks to place the milk bags in in case they leak. Hope your travels go well! I recently had an unpleasant surprise when pumping-while-traveling, and resolved to post the experience to any applicable blogs, so here goes. I did a lot of research ahead of time, and everywhere I looked I read, “have the hotel stash your ice packs in their freezer for the trip home.” It never occurred to me that I might find myself at a hotel without a freezer! This was in South Lake Tahoe at Harvey’s, and the manager (who was not a very sympathetic guy, and I couldn’t find a female manager, but that’s not important to go into here) claimed that they have no freezer in the hotel at all, including for the employees’ use, except in the restaurants, who would never allow me to use their freezers “for food safety reasons”. After (1) running around to various hotel staff (since I wasn’t sure how trustworthy Unsympathetic Manager was), (2) calculating the (large) volume of ice I’d have to get to replace the ice packs, and (3) contemplating whether the flight attendants would be able/willing to replace that amount of ice en route when it melted, I eventually settled on (4) begging a restaurant to stash my ice packs in their freezer. Fortunately (4) worked. I don’t know if there are any food safety regulations that were violated in the process, or whether another restaurant at another hotel would do the same. So, pumping moms, for future reference, it’s probably a good idea to check in advance about the availability of a freezer, if you’re not comfortable winging it with bagfuls of ice or dumping the pumped milk. Oh, wow, this is good to know. That was a great idea to bring it to a restaurant, and I’m glad it worked! Medela sells wipes that you can use to wipe down your pump parts when you don’t have access to a sink to wash or rinse them, or a fridge to store them in in-between pumps. These wipes are also handy for removing milk residue on pump parts before you stash them away until your next pumping session. The tip to bring extra valve membranes is really important, as I discovered on a recent trip. Thank you for the travel tips. I’m looking for a cooler to fly with (will be gone several days) the link to the cooler you use does not work. Are you able to reply back with the link? I would greatly appreciate. Thanks! I would also add, be wary of differing power supplies when travelling internationally. I got caught on going from the USA to the UK for a conference I fried the motor on my pump with the stronger power supply there! Thus ensuring a _very_ painful night until I could find an open store the next morning that sold pumps. Having a back-up handpump in your luggage just in case is not a bad emergency plan.